It registers now as kind of odd to me now that we never had an Xbox since we were so on top of the video game consoles of the time. But a close friend of ours owned one, and it was open to use whenever we wanted, so we never actually needed one. I also have to admit that the Xbox was rather strange to me at first. I mean, Nintendo and Sony had been offering the world lots of gaming goodness for awhile, and suddenly, in walks Microsoft with its giant, black box and a new Halo title and I’m just expected to bite? I dunno… That said, I wasn’t about to turn down some new gaming fun when given the chance. So whenever we went over to our friend’s house, the Xbox happened; and among his small catalog of games I found a few that I really enjoyed. (A fair portion of my experience with original Xbox games actually happened later on the Xbox 360.) When it came to choosing games for my island, the choices came down to those games I had played the most, and only four rose to the top. Microsoft released the Xbox in November 2001. The thing quickly sold out in the U. S., though overseas sales weren’t that hot. It was a hefty machine with a controller to match, but the Xbox ran its games beautifully. The console featured a number of exclusive titles including Halo 2, Ninja Gaiden, Jet Set Radio Future, Project Gotham Racing, and many others. One of the Xbox’s nicest features was that it had a hard disk drive for game saves — no more keeping track of memory cards! A year after its launch, Microsoft offered us Xbox Live, a subscription service that allowed members to play with others online and download games right to their hard drives — imagine that?! 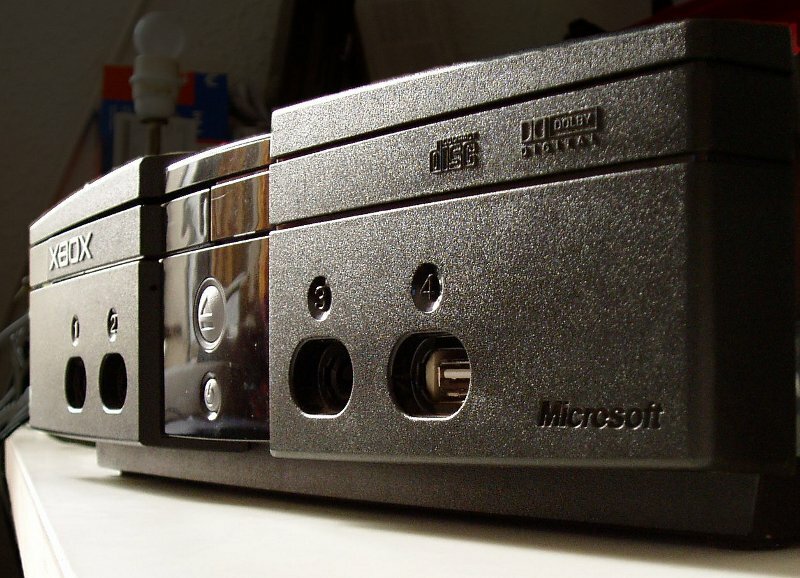 Though Microsoft never saw sales figures like those of Sony and Nintendo, the Xbox gained a dedicated following before being discontinued in 2008. I’ll be honest, I don’t do so well with horror games anymore, and that includes DOOM 3. It’s kinda scary and there’s a key scene that sets off the events of the game that I have a hard time getting past. But during the rare sessions in which I’ve managed to quell my nerves, DOOM 3 has been ridiculously fun. But with an 8-year span between the release of DOOM 2 (one of my staple 90s games) and DOOM 3, the game was lucky to be on my radar when it was released in 2004. By the time I got the game, we had moved onto the Xbox 360, which was (and is), thankfully, backwards compatible with Xbox games. Returning to the world of DOOM took a little effort since I was so out of practice with first-person-shooters. And I’ll definitely need to hone those skills on my island, y’know, in case I have to shoot anything, which I’d rather not do, but will…if I have to. A lot of the best games I’ve played are those that I never actively sought out. They’ve appeared in my life at the right times, in the right places, and that was the case with Fable. One day in 2008, my husband brought home a copy of Fable that he had borrowed from a co-worker who though he might like it. Well, turned out that he didn’t take to it, but I did! Knowing nothing about the game, or the fact that Fable 2 was due out soon at the time, I found myself absolutely caught up in Fable lore and gameplay. Fable offered robust RPG mechanics along with some moral choices, plenty of enemy encounters, and a fair amount of character customization. Much to my surprise, I had a blast playing as the hero of Albion, and I’d happily do it all over again in a heartbeat. A billion years ago, I played a teensy bit of Oddworld: Abe’s Oddysee on the Playstation. This platform game, the first in the Oddworld series and set in the strange world of the same name, relayed the adventures of Abe, a Mudoken, who had to save his race from becoming food products. The short experience was memorable enough that years later, when Oddworld: Munch’s Oddysee (the third game in the series) was released for Xbox, I simply had to give it a go. The game was a 3D platformer set again in the utterly bizarre yet hilarious space of Oddworld, only this time Abe was back helping a lone “gabbit” (think: frogish creature) from becoming extinct. The game looked great and played ever so well on the Xbox; and maneuvering Abe through the game’s many puzzles kept me plenty busy. I could imagine my island looking something like Oddworld, except without the aliens and slimy, green soda. I had no idea of Serious Sam’s PC/arcade past when I first played the Xbox remake. All I knew was that the game was an immensely fun first-person-shooter. Take DOOM and give it a funny bone – that was Serious Sam. I don’t recall there being much of a story, but I do recall the crazy levels with little cover. Rather than taking out enemies strategically and veiled, Serious Sam was was like a game of dodgeball. With a cast of wild enemies hurdling bombs and the like in your general direction, you had to have some mad reflexes to consistently jump and shoot. And though Sam didn’t have much of a backstory, he did have a pretty good sense of humor, which made the game as funny as it was frenetic. This game wasn’t a massive hit in its day (though it should have been), but it’ll make more than waves on my island! In the end, I think I watched more games on the Xbox rather than playing them myself, but I’m glad that I had a chance to experience it, even if that experience was limited compared to that with the consoles that I owned. But I’m grateful for having even a small chance with the Xbox, otherwise the next console in line, the Xbox 360, might have never crossed my path! Oh, the horror! Now that’s gonna be a really hard list – the 360 has been my preferred console since we first got one; and the games I’ve played on it have all been absolute favorites. How in the world am I going to choose the best of the best? All will be revealed in the next “deserted island” list! P.S. On a sadder note, this list marks my third to last in this series. All that’s left for me is the Xbox 360 and PC games. I just want to thank everyone who’s been reading and commenting so far. This has been a really fun series to write! I’ll be sad to see it go, but if anyone out there starts up their own similar series, be sure to send us the link so we can follow along! Previous Post Play, Share, and Win! Next Post PAX Preview (the 1st)! I don’t have a whole lot of good games on the XBox consoles, so I will combine the XBox and the 360. Definitely “Final Fantasy XIII” and “XIII-2”. Not the best “FF” games out there, but I enjoyed them, and they will kill a lot of time. (“FFXIII” took me over 100 hours to beat.) Also, “Halo 4” because it was my favorite “Halo” game. “Sonic’s Ultimate Genesis Collection” has 49 Sega Genesis games on it, so that’s a must-have. I’m not a huge fan of those games, but it’ll certainly give me a lot of variety. And “Star Wars: Knights of the Old Republic”. I wasn’t as impressed with it as many others were, but I believe your decisions really have an impact on the story, and I could play it many times and have different things happen. Next time, I’m choosing the Dark Side. Oh man, 49 games — I never heard of this collection and it sounds wonderful! And FFXIII is one FF game that I’d really like to sink some time into someday. I know it doesn’t have the best reputation, but still…I’ve heard that it can be fun. Long, but fun. I didn’t jump on the KotOR bandwagon years ago, but I’ve thought about getting it and sticking in my backlog so at least I know it’s around when the right time comes. I’ve missed out on a lot of the recent Star Wars stuff mainly because I didn’t want much to do with it after those new movies. Maybe 2017, the 40th anniversary of Star Wars will be a good time to head back in. I won’t be too…much…older by then. I had completely forgotten about Munch’s Oddysee! I loved that game! Time Splitters 2 is another I have fond memories of, in my early console gaming days. Fable would definitely be on my list, but Star Wars: Knights of the Old Republic was the one that started off my real gaming obsession! That defines the Xbox for me.. and Jade Empire! I’ve seen it on Xbox Marketplace and I’m so tempted for nostalgia sake (the disc went missing long ago)! I remember playing an hour or two of the original Time Splitters game, but I just couldn’t get into it. It’s a shame now because I’ve heard such good things about the games since. Nice to know that KotOR is in the Xbox marketplace! As I mentioned in another comment, I might have to look int playing this someday. I didn’t have the patience (or skill) for the main story of Time Splitters 2 at that time (also shooters aren’t really my thing).. but I would play A LOT of the arcade challenges, and multi-player with my brother. They were really fun, I ruled at Capture the Bag! The characters were really funny. I seem to remember you could be a burning man and set other people on fire. It’s been a long, long time though! KOTOR is brilliant, I’d definitely recommend it! Honestly.. it’s just so cool. You can have a purple lightsaber! Jade Empire is in the marketplace, no KOTOR unfortunately. It would be good if they did though, the discs are really expensive now for console. Luckily we still have ours!